Sunday Brunch's presenting team and special guests from 4th November's episode. Photo: Channel 4. 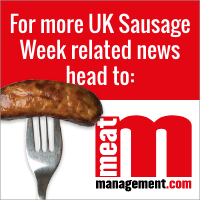 Popular breakfast TV show Sunday Brunch marked the end of UK Sausage Week on Sunday 4th November when its presenters Tim Lovejoy, Simon Rimmer and comedian Russell Howard tasted Frank Parker Butchers’ winning bangers live on-air. 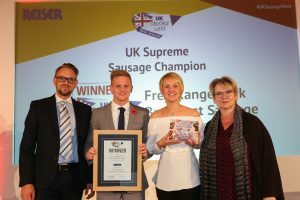 The Nuneaton butcher’s shop received the UK Supreme Sausage Champion crown at the UK Sausage Week celebration lunch for its Free Range Pork Breakfast sausage – beating more than 500 other bangers to the title. Lovejoy and Rimmer put the sausages centre stage in the studio’s kitchen and invited Howard to sample them. 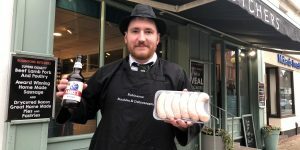 Lovejoy said: “This is the best sausage in Britain – UK Supreme Sausage Champion. It was crowned this week. 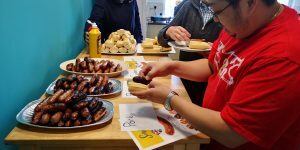 The winning sausage is Frank Parkers’ homemade Free Range Pork Breakfast Sausage. 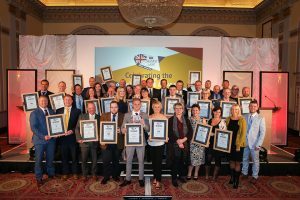 The show was just one example of the national media coverage UK Sausage Week achieved. The campaign received mentions from the likes of Chris Evans, Jo Whiley, Simon Mayo and The Hairy Bikers on BBC radio, as well as from Chris Moyles on Radio X and also by the Heart Radio presenting team. The Daily Star newspaper also ran a special feature, not forgetting multiple regional newspapers, consumer food magazines and popular food blogs. To watch 4th November’s episode of Sunday Brunch, click here.